How We Do It - Welcome to Webs-a-gogo! Home of the FREE Website Builder and Designer. Experts in Business Websites | Personal Websites | Professional Websites - Webs-a-gogo/Websagogo provides a free and easy website builder for creating Website Designs for a high profile Business, Personal or Professional web presence. Our easy Website Builder offers pre-designed and Customizable Web Designs. Webs-a-gogo WAG-PACs include a Free Domain Name and Website. How does Webs-a-gogo provide such a rich value and service all packed into our WAG-PAC offering? We've been doing this a long time. We've built so many websites over the years that we've come to understand the stuff people need on the web. No matter what the purpose of your site we have a plan for you. And that is the mindset we took when designing the Webs-a-gogo Self-Edit website module (WAG-MOD). In fact, most other website companies can't run with us for a couple of very important reasons. One is because not we are not just the website developer, we're also the server host. So we can leverage both sides of the field, the Host Servers are ours and the development technology, code and vision are ours. Together under one roof, what is normally two separate divisions or "companies", at Webs-a-gogo...is one! The seond reason is resource. Our company has been in the Internet Business since 1993. Over the years we have built many partnerships, and market strength. This provides us with the staff and creativity necessary to bring a big value to our clients. Every client we have served over the years has taught very important lessons about service and customer needs. One of the greatest of these is to ensure that the client is successful in using our product. Make sure it has value that is meaningful and actually helps them in their business or lifestyle. The other is...make it simple to use. No matter how great our inventions and innovations, if it's too complicated, nobody will want to use it. Although every client is unique, one things about our clients primary purpose is not. Success. 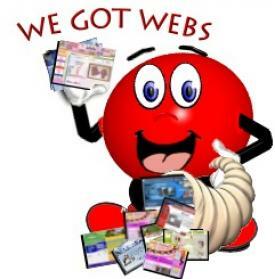 Our clients have showed us they want to succeed on the web. That's why we have built Webs-a-gogo the way we did. To provide every unique customer the tools and features they need to do just that...SUCCEED! And since every site and every customer is unique, we built our Websagogo Package (WAG-PAC) with your uniqueness in mind. Thats why we developed the Websagogo site module with almost endless customization capabilities. Whether you are running a shop out of your garage, your livingroom or the 110th floor of success tower, we have the ability to put forth a positive and lasting image that will support your needs and make you look good doing it. Unlimited number of WAG-MOD webpages (what we call press article pages), as well as other content pages. Unlimited Images Uploads for picture, graphics or other images with our image resampler to optimize your pics in multiple sizes for fast page loading. Web-Based Calendar/Schedule with unlimited calendars. A Product/Services catalog; customizable for any business with labels you choose, image slideshows, video, customizable text and colors, e-Commerce integrated shopping cart. Works with a Merchant Accoutn from Authorize.net or PayPal. Blogs, MP3 player, Guestbook, Contact Forms, Favorites, HotSpot Marquis to make pages or catalog items stand out on your homepage, Subscriber Mailing lists and much more.. Unlimited support to help you learn and use your Webs-a-gogo Website Module (WAG-MOD)! We even provide you with your own personal web specialist. What we call your Webs-a-gogo Personal Administrative Liaison or Web-PAL for short. And attitude that your business is critical! We are always reminded of a very important motto of ours here at Webs-a-gogo... Your Success = Our Success! Click here to see all of the features and options currently offered in the Webs-a-gogo WAG-PAC ! Choose from any one of hundreds of pre-designed websites, fully integrated with our Webs-a-gogo Module and customizable to your taste and needs. Select from one of any of our WAG-PAC hosting packages. This is the package your buy which includes your Domain Name and Website above. Simply signup for a WAG-PAC, pay a monthly hosting fee and you're all set with everything you /need to make an outstanding impression on the web. WAG-PAC hosting plans start at just $5/mo. and go up from there according to your needs.